Orotti-Spiced Rice fritters – Welcome to Creative Rajni! Orotti is one of the traditional breakfast items in Kerala usually had along with Masala Chaya(Masala Tea) infused with spiced milk. 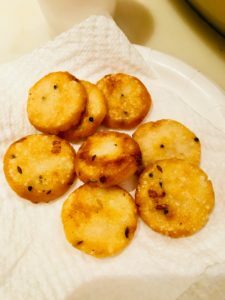 These are spiced rice fritters along with fresh grated coconut and spices and fried to perfection. It has a very crispy exterior and a very soft interior which melts in your mouth. 1. Soak the rice overnight with 3 cups of water. Next day drain the water and dry the rice in a paper towel. 2. Once dry, powder it very fine along with the coconut and set aside. 4. Now add in salt and pepper and mix well. Add in the rice coconut mixture and stir well. Slowly add in the hot water and stir well to combine until you get a soft dough. 5. Once well combined let it cool. 6. Once cool, make small patties out of this dough and keep aside. 7. Heat coconut oil in a deep pan and fry each patty for about 2-3 minutes each side on low heat or until golden brown. 8. Serve it with a hot cup of tea with milk and enjoy!